We have all made a TODO list at some point. Some of us live by them (ahem…puts a hand up), and some of us are comfortable going wherever the day takes us. The process described here takes a longer and broader view by being intentional about ensuring TODOs are being evaluated against weekly monthly and long-term goals. It also provides the opportunity to be intentional about thinking through your actual time commitments in your week and setting realistic and achievable goals. It clears some of your mental clutter so you can focus on the immediate priorities while still encouraging long-term planning. Longer term items are captured but you don’t have to carry them with you all the time which gives you a bit more bandwidth to deal with the inevitable surprises that will disrupt your carefully laid plans. It is easy to be busy. It is harder to be productive. This is the process that I work through with many of my consulting clients. In the world of entrepreneurship, formal goal setting is very common and talked about constantly. It is something that is supposed to be part of your everyday narrative and your goals are to be used as a guide in all decision making. I am not sure how prevalent goal-setting is in the day-to-day of other contexts, but it can be very powerful both professionally and personally because it forces you to really consider if whatever you are doing is helping or hindering your efforts to reach said goals. 1. What are 3-5 major goals that you want to achieve within the next year? For example, an annual goal we set last year was to rebrand AgileStyle to Code and Effect. 2. What are the short-term goals that will help bring you closer to achieving those goals? Communicate rebrand to existing customers. Redecorate the office to match new brand. 3. What goals have been hanging over you and need to get done, or what goals have been in the back of your mind that you haven’t acted on? For example, I want to plan a trip for next spring but have no idea where I want to go. I need to write it down and set some smaller subgoals to help me move forward in the planning. Once you have some goals set, you can braindump your TODOs to get them out of your head and on paper/whiteboard/spreadsheet. At this point, they don’t need to correspond with anything. You can organize how they fit into your goals after (see step 3). Write down everything you can think of that you need to take care of, both personally and professionally, even if it seems small or random. The benefit of this exercise is that when you have all these things swimming around in your head, it can be a great relief to write them down. It is a clearing of mental clutter. When you can’t think of anything else, and you have your long list of projects and TODOs, you can then organize them and connect them back to your goals. I often use a spreadsheet (Google Sheets) with my consulting clients who I work through this process with. It has live updating so we can work through it together in real-time. I also personally use Asana, depending on the complexity of my Intentional TODO list. Warning: don’t get caught in the trap of trying out new software for organizing your goals. 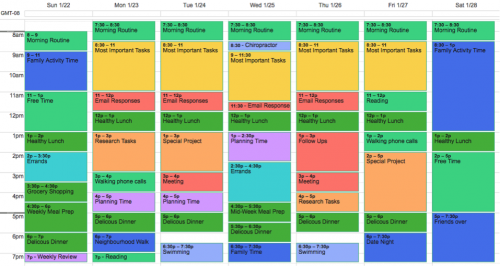 Pick something you’re already familiar with (Excel, Reminders.app, Gmail Tasks, Outlook Tasks, etc.) and stick with it. Exploring software is actually procrastination and won’t move you forward on your goals! Goal – What medium-term goal does this project or TODO help bring you closer to? Project – What are the weekly/monthly goals/that relate to the medium term goals? TODO – What are the individual TODOs that will help you reach your weekly or monthly goals? Due date – When do you want/need to have this completed by? Estimated time – How long do you think it will take you to complete? Person accountable – Who has this TODO been assigned to? Notes – Any additional details or comments. When you have your projects and TODOs recorded in your spreadsheet or app, you can move on to evaluating their importance and/or urgency and then prioritizing them. One of the ways to think about prioritizing is to ask: Does this TODO move you closer to achieving one of your goals? If it doesn’t, you should ask yourself if it is actually a priority. There will be things on your list that are just life TODOs that need your attention so they might still deserve priority but it is worth going through the thought exercise. For example, perhaps your need to do your taxes. This is probably not associated with a specific goal, but they still need to be on your list and prioritized. There will also be things that can fall off your list for the week that you can move to a parking lot. These are things that will eventually be a priority but can be pulled out of the immediate list for future attention. Now you need to date everything. Some of the TODOs on your list might have hard deadlines, others might be more flexible. I like to fill in all the hard deadlines first and then estimate due dates for the flexible TODOs based on the hard deadlines. Also, some TODOs will need to be completed before others can be started. These will help set the order of priority. I will preach it again here because it is so easy to overestimate what we are capable of achieving in a day or week. We often forget to take into account the randomness of life where we get sick or have appointments, or kids activities, or family commitments, etc. As mentioned in my task management post (which has a slightly different flavor of TODO listing), Parkinson’s Law states that “Work expands so as to fill the time available for completion.” The idea is that you have to set reasonable boundaries which will help control procrastination and constant re-working. You can do that by estimating how long you think it will take you to complete each TODO. If you have 15 TODOs that total 15 hours planned for one day, it is probably not achievable and you need to re-prioritize. As you are time-blocking you can set accountability for TODOs that you don’t actually have to do, but are responsible for making sure they are complete. You can then add the delegation and follow-up TODOs associated with them so you still stay on top of them. For example, perhaps you asked your assistant, Dave, to order new business cards. You are responsible for getting new business cards, but you have delegated to Dave so he is now accountable. He should report back when the business cards are ordered but it’s OK for this TODO to stay in your spreadsheet until he does. Finally, this time-blocking also gives you the opportunity to make space in your week for the unexpected and self-care. If you fill every hour of every day, you will burn yourself out. You need to build in downtime to recharge. You can also build in flex hours that are uncommitted work time to try to get ahead on something. These hours can be used to help manage the random fires that will inevitably come up. Now you have everything you need to move forward with your week in an effective, productive, and intentional way. You will be working towards the goals you set out and knocking things off that list like a boss. Remove done items that haven’t been updated. Reprioritize any TODOs that didn’t get done last week. Revisit the parking lot to see if anything needs to get slotted back into the priority list. Update the goals as you complete them with new ones. This list ends up being a weekly plan that you can pull your daily TODO list from. You can wrestle back at least some semblance of control so you don’t feel like you are being pulled in a million different directions and not actually going anywhere. It can also help you balance your time so that you can fit in self-care. Pick 30 minutes on the same day every week to revisit your Intentional TODO list. It doesn’t matter when, as long as it’s in your calendar and becomes part of your habits.